So I got a Wildstar Beta, and there’s a beta weekend this weekend. So I am excited, but don’t be all ‘jellin I got it. I’ll fill you in what I’m up to. Why Wildstar and not ESO? I never been a huge ESO fan, from The first Elder Scrolls games to Skyrim..Oh I tried just couldn’t get into them. Don’t know if it’s the UI. First person throws me in RPGs looking at you Ultima Underworld. I just prefer third person view thanks to my long run with that view in MMO”s. I hear you can run in third person, but there are some other issues like lore. Some reason just didn’t get into the lore either. I can go on but I digress. Which side will I choose? Well I’m Lawful Evil, so going Dominion, and probably start off as a Cassian. Warrior- Tank. I played a Tank in almost every MMO I played. I love being a respected member of the group. Looking at Soldier – Holdout – Protect seems like the path to go for a Tank. Things may change once I get into the game, and see how it plays. Hell even to see if I like it or not. I am looking forward to it though, I hope it turns out well. 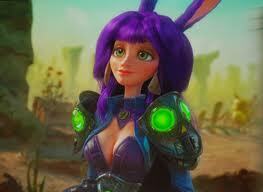 This entry was posted on April 3, 2014 at 5:15 pm and is filed under MMORPG with tags Wildstar. You can follow any responses to this entry through the RSS 2.0 feed. You can leave a response, or trackback from your own site. Enjoy, it certainly took me a while to get used to some of the mechanics/combat but after the second beta I was sold on it. I’m totally Jelly. If you hate it let me know. Or if you get a second. Or whatever. I just can’t bring myself to pre-order it. Not sure what the reservation is! !